A sentimental journey into my past and into my present, as there would be no present without the past. A collection of recipes, pictures and thoughts. A vehicle, really, to allow me to "find" myself, once again, through my travels in a wonderful time capsule smelling of Borotalco, green Palmolive soap, basil and the smell of the sea, which came in through our windows in my past and forever present time in the place where my soul wants to be: MY WONDERFUL ITALY! 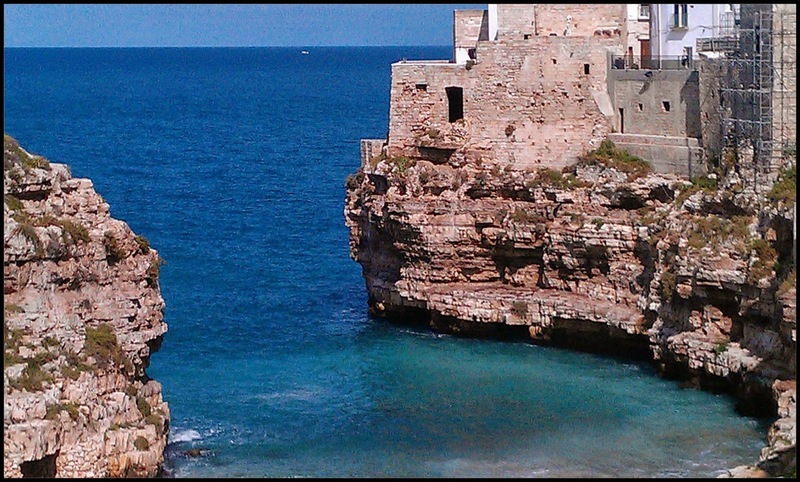 Beyond that window are the blue sea, and the sky. Even the rocks, above the water, are full of life, as little creature live in them and make sounds you can hear, at night, if you walk on those rock warmed up by the sun. I want to go there, today, inside my secret place, behind the window and the grapevine, and share a little clip from the movie which has been my life, until today. I am walking home from school, a little girl of maybe eight, with a group of friends. My satchel feel heavy and I feel lazy. There is a place, a kind of enclosed court yard, surrounded by blocks of flats. I know I shouldn't cut through that place, because I am not allowed, but today... today I am going to be naughty, like Collodi's Pinocchio and I will do what I want to do! I am going that way! We walk and we sing. We swing our satchels, we chase each other and we laugh. Oh, how I enjoy feeling free! They will never come looking for me here! Suddenly, my friends go quiet. They stop running, singing and chasing me. I stop... I feel him behind me... he's big, he's tall... he's blond... oh, my God! It's my Dad! I shout "Babbo! Che fai?" ( I knew very well what he was doing...) "Ti ho detto mille volte di non venire qui!" "I told you thousands of times you mustn't come here!" Then, he... gets hold of my letf ear, just like Mastro Geppetto did with Pinocchio, when he sold the gold buttons off his jacket, and drags me, like a donkey, all the way home! 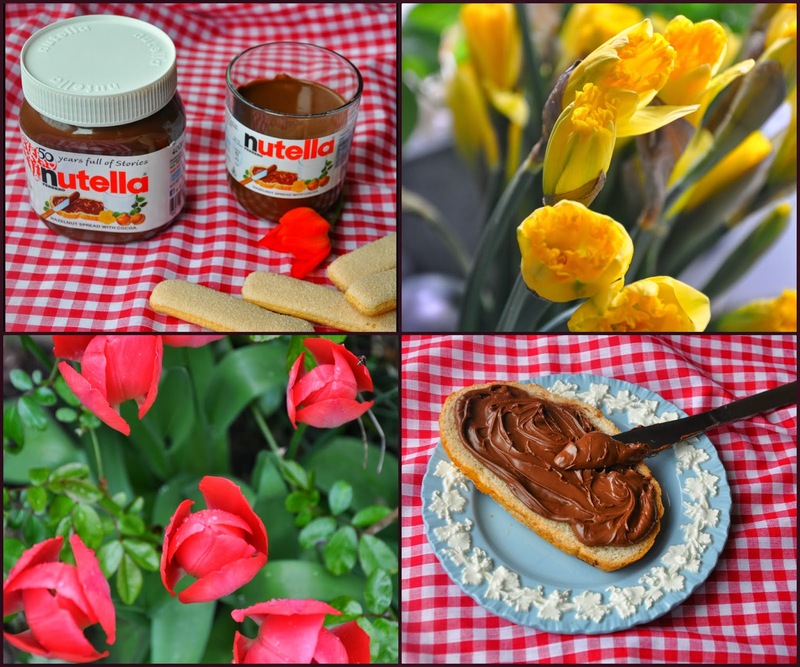 Anyway... he must have felt really bad, because a few minutes later, he came to see me and gave me a little plate with a fresh slice of crusty bread with lots of sweet, delicious Nutella spread all over it! "Fai la merenda. Avrai fame!" "Have your afternoon snack. You must be hungry!" He then took me out and bought me an ice cream! My poor, dear Babbo! He must have felt guilty! Last week, I bought an enormous 750g jar of Nutella! Wow! And I actually used some of it to make a semifreddo. I only made it to stop myself from eating all that smooth deliciousness, but... my semifreddo was so good, so I will make one for you! Place your Nutella in a bowl and heat for about 20 seconds in the microwave, or in a saucepan, on the ring, if you prefer. Set aside. Till will soften your Nutella. Next, place your eggs and sugar in a bowl and whisk over a pan of boiling water, until you get a beautiful creamy texture (this will take about 5 minutes) a bit like a zabaione. If the water is boiling too fast, turn down slightly. Set aside. Using a cheese grater, grate your dark and white chocolate. Your cream will have to be whipped, too, in a largish bowl, as this is where all the ingredients will have to mixed, but make you don't over whip, or it will separate. Now, you have most of your ingredients ready and you can START! Add the whisked egg mixture to the whipped cream and gently fold. Next, in goes your Nutella, which will have to be incorporated, again, gently. At this point you should get a soft, airy chocolate colour mousse type mixture... very nice! Add a tbs of liqueur, if you wish, or some vanilla essence, plus your grated white and dark chocolate. Mix lightly and taste. You have to have a taste... you will be tempted! Now you can line a container with cling film. Use two long pieces which will cross in the middle. Make sure the cling film overlaps the tin. Be generous. I made my semifreddo in a bread tin, lined with cling film, as I like the shape, and it makes my semifreddo easy to slice. I gently poured my mixture into the tin ( as you can see from the picture, I also added a few teaspoons of Mascarpone, unsweetened. I let it slip into the mixture and covered with a few Savoiardi, or Boudoir biscuits gently and quickly dipped in a sweet liqueur. Having made sure I used enough cling film, I gathered the excess over the top of my semifreddo, as you can see from the pictures, and placed in on a flat surface in the freezer. Semifreddo takes five to six hours to set. When it's ready, you can turn it out onto a serving dish and decorate any way you like. You can use fruit dipped in chocolate, chopped nuts, meringues, mini eggs... anything! Be very creative! you will have such fun! 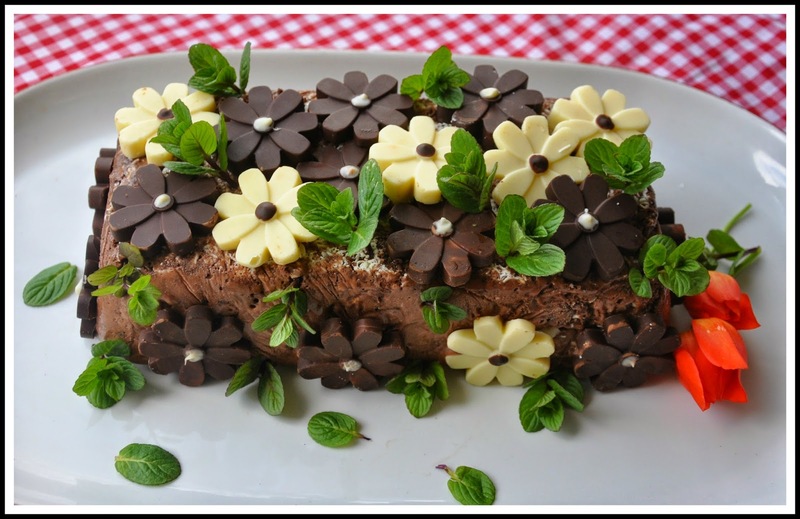 I made a few very pretty dark and white chocolate flowers, which I placed all over my semifreddo, with mint shoots from the garden. It looked so pretty! Too pretty to eat, really! But what can you do? A person's got to do what a person's got to do! The air was still warm, though a slight breeze played with the lilies and the pink geraniums, on the bedroom balcony. Through the wooden shutters, she could see the sky: beautiful white clouds were chasing red and blue horses, up in the infinite. She felt happy, as she could smell Summer rain in the air. ... And that song always leads me back to a time of love, happiness, warmth.. family... my beautiful family... still here... in my heart... in me... why can't we leap back to the past and stay, just for a little while? There is no consolation, I know, but I do like to remember our happy, sunny, full of music home. And my parents... where are you, home of my young years? 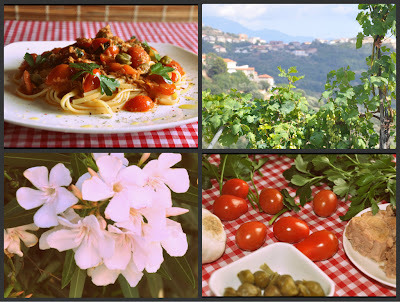 Finding a connection between my family and a recipe... well... it may seem silly, but, being Italian, you can't help loving and sharing food with those you love. It's what I have learnt from my mum. She grew up without a father, in a very strict family where people didn't show affection by kissing and hugging. But she had other ways of showing her love. I still remember falling asleep with my head on her lap, on the sofa, in front of the television, while she "secretly" stroked my hair. You will probably laugh when I tell you that I was seventeen! Nobody taught her how to be openly affectionate, but what I do remember, was all the time we shared together in her kitchen, cooking, laughing and sharing that precious time together. Food... sharing food... doing things together, with love can be more meaningful than a hug. Anyway! This morning I went out with my sister. The lady in one of the greengrocer's, Teresa (she has the most wonderful turquoise eyes!) was so welcoming and she had these huge, round aubergines for sale. 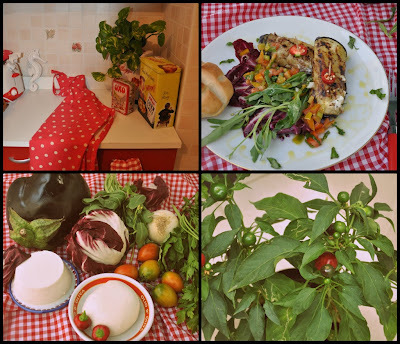 My mum loved aubergines and we often had them in Parmigiana, stuffed, or preserved in olive oil. With her in mind I bought this huge aubergine. 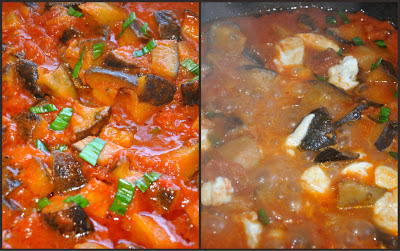 Today, I wanted to try a new way of cooking this versatile vegetable, as yesterday I saw an intereastin chef on TV. The dish he prepared inspired me. I believe I changed and improved on the original, the chef's version, and made it much more... delicious! A kind of a first for me, as we don't usually use ricotta in savoury dishes. Anyway... do try this dish and be creative with the filling! I went vegetable shopping with my sister. The choice of fresh vegetables is unbelievable. 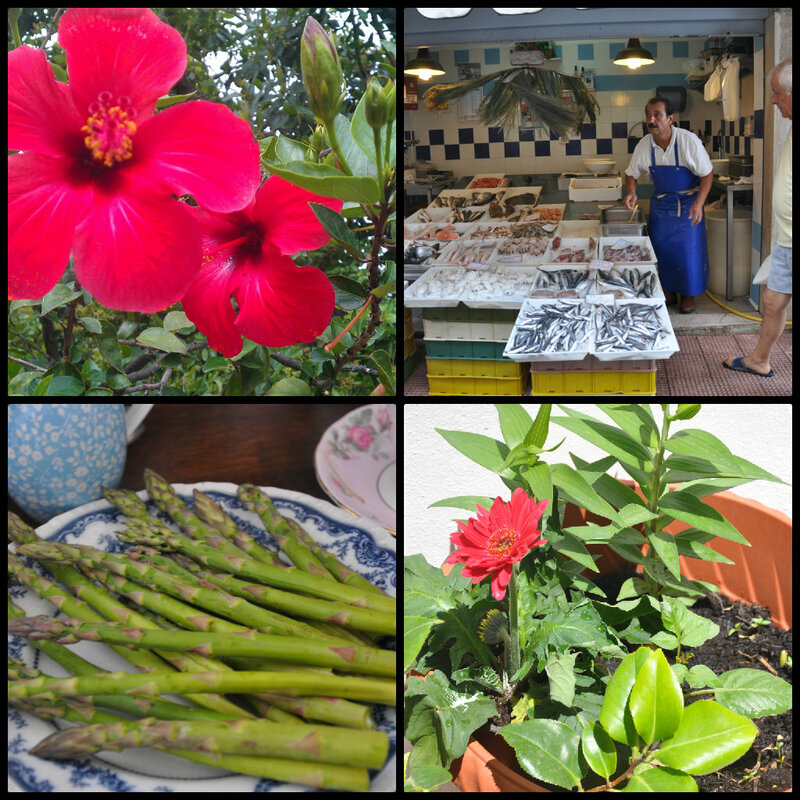 Everything is locally produced, very fresh and organic. 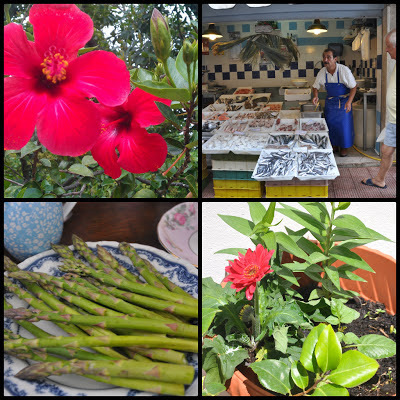 Most stalls are held by local farmers, proud of their fantastic produce. 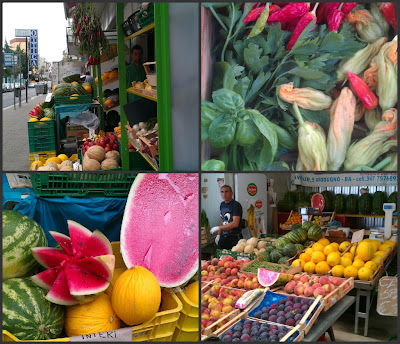 Walking round an Italian market is a feast for the eyes. I don't know if you have read the Odyssey, but, well... I can't help feeling like Ulysses, who had to be tied to his ship, so he would succumb to the song of the mermaids... I want to buy everything... I look at everything... If I could, I would buy the whole market! Anyway! I bought just one of those huge aubergines, like the ones my mum used to buy.. big, fat and grown in the southern Italian sun. It weighed more than a kilo! I took it home and decided to try this new recipe. The original recipe was cooked by a chef, on TV, but I have used his basic idea, to produce my own, healthier version. I cut my aubergine in half. I then cut six 1 cm deep slices. Rather than fry, I decided to use very little oil on my old griddle pan and grill the slices, until they went golden and kind of "toasted." I placed the slices on my mum's old pastry board to cool down. I cut my mozzarella into thick slices... and I was now ready to make my "involtini!" 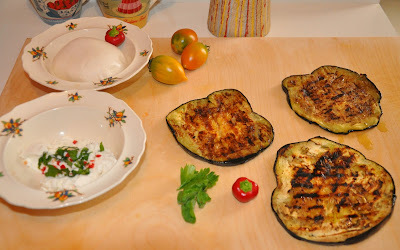 I spread my ricotta on each of the aubergine slices and placed one slice of mozzarella on top of it. I then added more flavours, using fresh basil, rucola (rocket) a bit of chilli pepper and more Parmesan. I made my involtini by rolling the slicing up and securing with a cocktail stick. DONE! I served my aubergine with a little tomato salad. As you can see from the image, the tomatoes I used are what we call "pomodori verdi" (green tomatoes) which is a variety of very sweet tomato only used in salads. I de seeded each one of my tomatoes and chopped very finely. I did the same with a small piece of onion. To this I added fresh basil, rocket, olive oil, and some white wine vinegar. Balsamic vinegar is a fantastic alternative, or any kind of vinegar you like! I placed some salad leaves (the purple one is radicchio, which I love!) on a plate and dressed with some olive oil and little salt. I placed one or two of my involtini over this and finished my dish with a cascade of my beautiful looking tomato salad. A fantastic Summer dish, also suitable for a cold buffet! The sea was rough and the sky cloudy, but the mermaids were still there, singing their song, sailing on waves, and tickling starfish, while the sun was playing hide and seek. She though of the past, long time ago... that day she went to the beach with her father. She was only little, the waves high and scary. I still don't know why her father sat her on a rock, like a little island surrounded by sea foam, sprays of salt water and bright green seaweed. Many of my childhood memories are connected with my father, who was a very sweet, lovely man. He never once shouted, or got cross. He always had so many stories to tell and so much love to give... I miss him! In Summer, Babbo would take me to the beach. He taught me how to catch crabs and how to hold them, so you don't get pinched. On the way home, he would stop the car and buy us both an ice cream.I always had vanilla... it's still my favourite! He loved ice cream more than anything! And he loved us. My dad also had a bike. It had a little seat at the front... it was my seat. Sometimes he would ride to the beach, with this tiny, proud little girl sat at the front. He paraded me like a little blond trophy. He was such a special dad, my beautiful Babbo! Today I went to my sister's villa. The beach is right across the street... I love it! 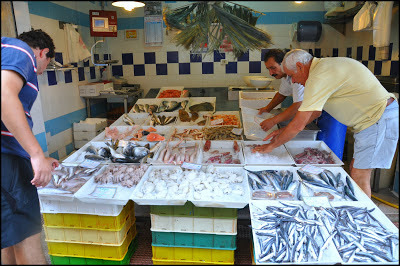 On my way back, I stopped to buy some fish. A big piece of bright red tuna caught my eye and I bought a couple of huge (expensive) steaks. I brought them home and decided to "create" something delicious with it, which I thought you might like, too! This recipe is very quick and easy! Place the oil in a non stick frying pan. When hot, add your pancetta cubes and cook until crispy. Next, add the chopped garlic. Brown, then add a sprig of fresh rosemary. Stir, so the flavours mingle. You are now ready to cook your tuna. You need to be very gentle with tuna, as it's very delicate and, if you're not careful, it will break and separate, just like the tinned stuff. Cook gently for about three minutes on each side, then add some lovely balsamic vinegar, as much or as little as you like. I like lots! And, if like me, you like a bit of "spice" in your life, some fresh chilli would be an excellent addition! But it's optional! What you "must" add is a little bunch fresh parsley. 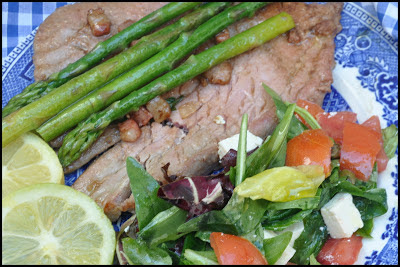 While you are cooking your fish, bring some water to the boil (I used a shallow rectangular dish for this) and cook your asparagus for just three or so minutes. Drain, place and set aside. If you want your asparagus to stay green, place it in ice cold water, after cooking. I am practical and very quick, in the kitchen, so I don't bother! 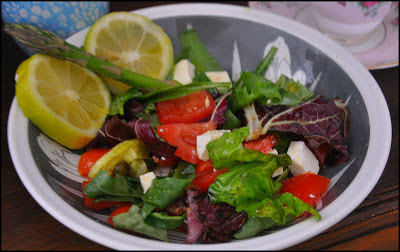 I served my asparagus with the fish and a lovely mixed salad of tomatoes, mixed salad leaves, capers, olive oil, fresh basil leaves and ricotta salata (a bit like Feta cheese, but nicer! Sorry, nice Greek followers!) You can use Feta, instead! Gnocchi (o pasta) alla Melanzana e Mozzarella. Ottima! Gnocchi or pasta with a wonderful aubergine (eggplant) and mozzarella sauce. Simply to die for! When I was a young girl, I used to spend my evenings at home and my two big sister would visit every afternoon... some days they spent all day at our house, which was always filled with the sound of children's voices, laughter and cry. Their little children came, too, and filled us all with so much joy! It was a bit like a "Little Women" atmosphere, with lots of activities going on: reading, knitting, crochet, watching TV, doing crosswords with our Babbo (we were all good at it!) and watching TV, all after I had done my homework, of course! Our mamma would normally be busy, in the kitchen, cooking supper. She didn't really knit, do crochet and was rubbish at crossword puzzles, but she could cook and she could certainly love. It was on one of those evenings that she used air freshener, instead of hairspray! We laughed so much! One evening, as I was looking through a magazine, I found a recipe: "Spaghetti al telefono" ... it sounded so delicious, I made it and it became a family classic, which I would cook, as my mum never strayed away from classic Italian cuisine! I never made the dish with spaghetti. Instead, I used penne or rigatoni, as I thought a short pasta shape would suit the sauce better. Eventually, this dish became a family favourite we called and still call "Pasta alle melanzane" because that's what it is: pasta with a most delicious aubergine based sauce! Today, I made this dish, using gnocchi. I love gnocchi so much, though we never had gnocchi at home. I want to share this recipe with you, hoping that you will try it. Cut your aubergine in half, then dice (smallish pieces.) Place your olive oil in the pan and when piping hot, add your garlic, This should turn a nice golden colour, but not black. Add your aubergine and stir. If you think you don't have enough oil, you can add some. 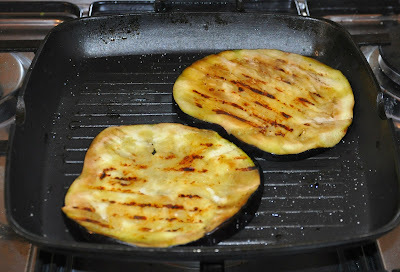 Aubergine does tend to absorb oil! 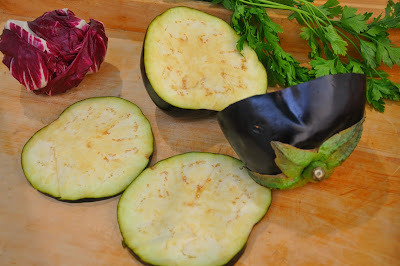 Cook until the aubergine cubes look translucent or even golden. At this point, you can add your tinned tomatoes, which you would previously have squashed, with the help of a fork. Add salt, pepper and chillies. Cook the sauce on a medium heat for 20-25 minutes. When your sauce is ready, add your mozzarella to the sauce, finely cut, and stir until the cheese has melted and the sauce has gone a pinky colour. Cook your gnocchi, by plunging them in boiling hot water. Gnocchi only take about a minute to cook. When they start floating, they are done! Drain and add to the sauce and don't forget to add a lot of lovely grated Parmesan or Pecorino cheese! This dish can be eaten as it is, or, if you want a golden crust, it can be grilled. It is also delicious with rigatoni or penne. I hope you try it, as it is not just delicious... it's also easy! Spaghetti o Linguine ai Capperi e Tonno ( Alla San Giovannino) Spaghetti or Linguine in a delicious Tomato, Tuna and Caper Sauce! She went outside to pick some parsley for her mamma. It was Christmas Eve and everyone was busy chatting, playing games, running about the house, up and down the long black marble corridor. It was always polished, really shiny and you could "ice-skate" on it! As she ran back indoors, as she always liked to run everywhere (and she still does!) she slipped and landed on the floor. The little stems of fresh parsley were dropped all over the place, so she quickly gathered them and went to wash the sweet smelling herb, under running water, in the kitchen. I must have somehow been able to capture that sense of feeling happy, protected and loved. I must have locked it away in here... in my heart, or in my soul. It's in me and I can feel it. How I wish we could still, all of us, be together. There is still so much we didn't say... so much we didn't do... the rest is all here... with me... I love to open a window on my childhood. I know that Proust said it before me, but... smells... fragrances are the key to the past. 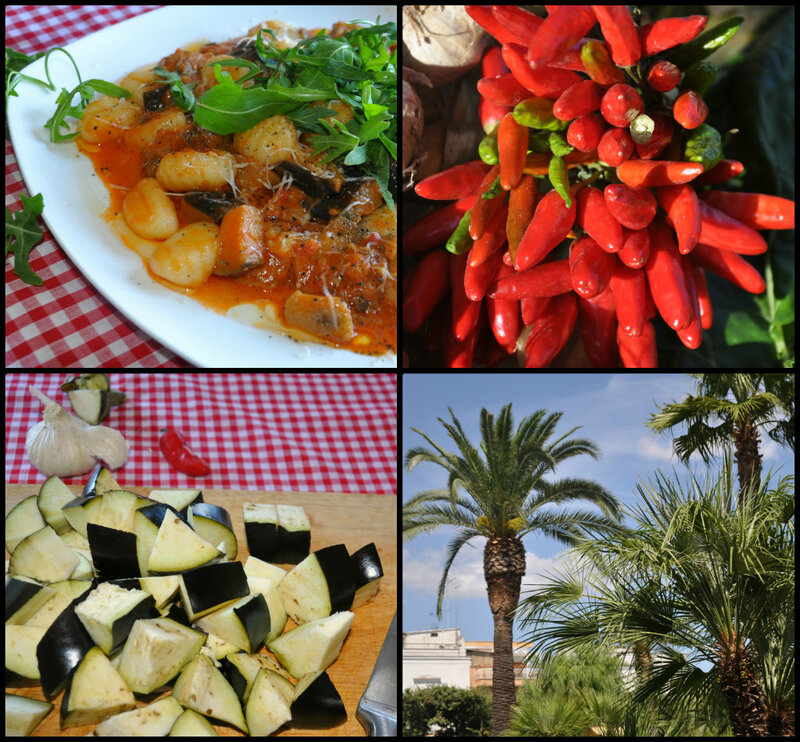 And I want to go back, through the smell of this dish to an "Eve"... Christmas Eve, New Year's Eve, The Eve of Saint John's Day, in June, when you might quite likely, in Puglia, eat this simple dish, which is absolutely delicious! Spaghetti "Ai Capperi e Tonno" alla San Giovannino. This dish, as promised in my previous post is very easy to make and, like all good Italian dishes, only uses a few ingredients. 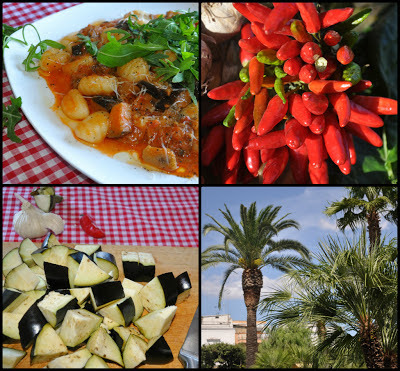 Though might be eaten on special occasions (the Eve of a celebration) also forms part of what we call "cibo quotidiano" EVERYDAY FOOD!" Quickly add your tuna, stir, then half cover with a lid, as the tuna will splatter all over the place! true! Give it a couple of minutes, enough time for the flavours to blend, then add your tomatoes (fresh or tinned- squash your tinned tomatoes up before cooking, if you want a good sauce!) some salt, and black pepper and bring to the boil. You can now turn the heat down and cook your sauce for 20-25 minutes. 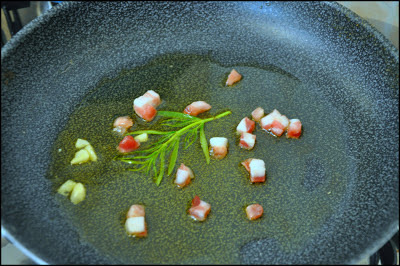 By now, your kitchen should be filled with a wonderful aroma: garlic and tuna are fantastic, together. Towards the end of cooking time, add your capers (I use lots, as I love the vinegary flavour!) and, before serving, take half of your parsley, roughly chop and add to the sauce, which, I assure you, is going to be magnificent! Cook your spaghetti or linguine, drain and serve with the sauce. Top each serving with extra parsley and black pepper. And now I feel hungry! D E L I Z I O S O!!!!! 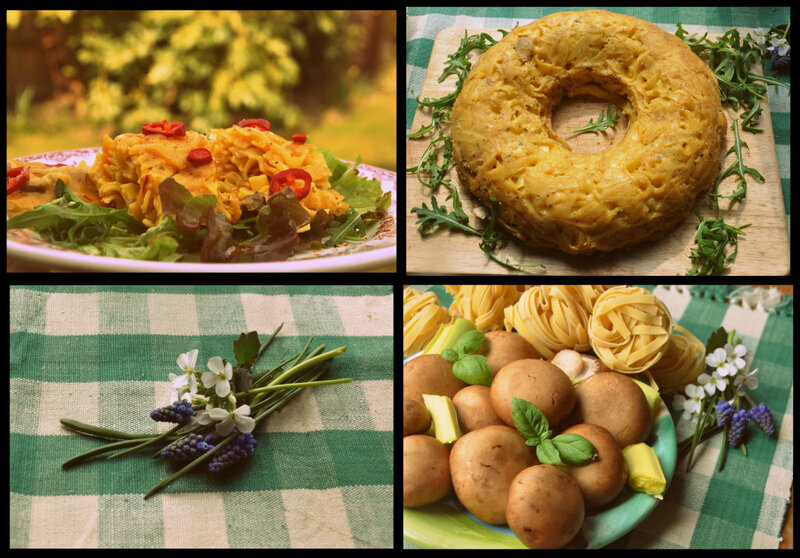 Ciambella di tagliatelle ai Funghi e Zafferano (Baked Tagliatelle, Mushroom and Saffron Ring) Don't be put off by the name of today's dish, as it's really easy and quite quick to prepare and very... very delicious! I would like to say that this is one of my mamma's recipes, but it isn't. 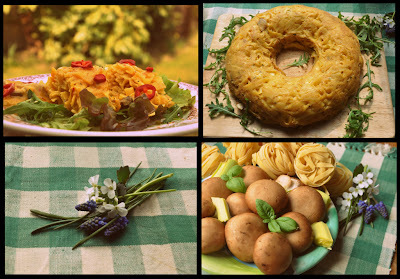 My mother wouldn't have known what to do with saffron, as it is an ingredient mainly used in Northern Italy, in risotto dishes. Our food, in Southern Italy, tends to be light and fresh. My tagliatelle, on the contrary, is quite rich, but deliciously so! I love the taste of saffron and, I must admit: bright yellow food cheers me up. I found the sauce recipe in one of my Italian magazines a few years ago and I thought it would bind my tagliatelle together very nicely, with some cheese, as I wanted to make a baked pasta ring, a kind of deliciously savoury "Ciambella" lovely to be eaten for supper, or sliced, an ideal dish for a party! It would go well with some chilled dry wine! Before you start, prepare your vegetables: peel and chop your onion, wash your leek very carefully and cut into chunks. Don't peel your mushrooms: just wash and slice or cut them into wedges. Boil some water (about 500 ml- about 1 pt) You can do this in a kettle. Having done this, put your butter and onion in a deep saucepan. When hot, add your onion and leek.Stir and combine these ingredients, until they turn a nice, golden colour. You are now ready to add all your lovely brown mushrooms! While your mushrooms are cooking and turning a translucent, shiny colour, measure your hot water: you need about 500 mls. Add a stock cube and your saffron to the hot water, which will, after two or three minutes, turn a very bright shade of orange. While your stock is standing, take two tablespoons of flour and add to the pan. Mix and take off the heat. Now, you can start adding your passata and, gradually, the stock and saffron. You should get a beautiful silky-shiny sauce, bright yellow, almost orange in colour. Again, mix these ingredients and finally, add your small cup of milk. Taste for salt, add some black pepper, if you like and... your sauce is made! Cook your tagliatelle really "Al dente." Remember that the water needs to be boiling, before you can add your pasta or you'll be eating glue! While your pasta is cooking, coat a ciambella ring (or a normal, round oven dish, if you don't have a ring shaped tin) with butter and then breadcrumbs. Drain your tagliatelle and place into a bowl. Pour two thirds of the sauce over your pasta, mix, making sure you have enough sauce, then add two generous handfuls of Parmesan cheese and 100 g Fontina cheese, cut into very small cubes, or grated Cheddar cheese, if you can't easily get hold of Fontina. Mix, arrange round the tin, pressing down as you go along, then bake in a hot oven (200C, 400F, Gas 6) until you get a soft crust. This will take between 20 and 30 minutes. Take your dish out of the oven, let it cool for ten minutes, then turn it out, onto a plate, or wooden board. Serve cut into thick slices, with some of the reserved sauce. found that rucola (rocket) is a good accompaniment, as it adds a pleasant element of spicy, hot, crunchiness. My "Ciambella" is lovely eaten cold, with salad. I think that cut into thinnish slices, even cold, it would make a delicious addition to a party buffet. I am writing this blog as it's the fun way for me to write the book I started so many times, but never finished. I want to carry on and persevere, hoping that one day I can say:"It's finished!" I am so enjoying the photography side of my blog. When you look at the world through a lens you notice things you never even "saw" before! I love being able to see "new" things and being able to add a new dimension to life. I want to dedicate my sweet little blog to the memory of Rosa, my lovely mother who left me very recently. She always was and will continue to be my inspiration. Pettole Della Mamma (sweet and savoury pettole-"zeppole") BUONISSIMA!